Having recently completed several months of archival research on the early Spanish colonial period in Mindanao, I thought it would be useful to share with other potential researchers and students the practical and personal issues I encountered during that time, with the objective of making their turn less disorientating and hopefully more productive. When my archival research project was still in preparation, I had turned to older, more experienced colleagues (Philippinists and Americanists) for advice, and they were quite generous with their time in discussing my project and in offering encouragement. However, I was unable to gather much information in terms of the practicalities involved. This was due in part to every project being unique in scope and requirements, and the fact that many of these colleagues had not been to these particular archives in recent years. Archival research is also such an individual and rather introspective enterprise that, in a sense, nothing but the doing can truly prepare you for it. Nonetheless, the dearth of practical advice made the prospect of archival research seem unnecessarily daunting, and the prospect of walking into Spanish archives downright intimidating. In fact, when I first arrived in Spain, I was still so nervous even after completing the application for my research permit that I postponed picking it up for a full week. This would not be relevant except that in every archive I worked in, the staff commented that I was the first researcher on the Philippines they had seen in a long time. In the case of the two religious archives, they told me it had been many years since anyone had expressed an interest in their collections. Reflecting on my own experience, I would wager that this apparent lack of interest is not, in fact, due to a lack of interest, or even a lack of funds, but due to the sheer intimidation that new researchers must feel when they ponder dealing with Spanish archives. I have written this article with that situation in mind, in the hopes that by providing some practical nuts-and-bolts knowledge that everyone can use at the outset, others will have a more realistic idea of what to expect, and more new researchers will be willing to make that journey. My particular project involved dissertation research that focused on religious conversion, missionary activity, and armed conflict in northeast Mindanao in the 16th and 17th centuries. It specifically required me to collect data from materials archived in the United States and Spain. The peculiarities of these individual collections will be explored further below; for now let us begin with the archival researcher’s most essential tools. I will never forget my first encounter with Spanish script from the 16th century, a photocopy of diplomatic correspondence from Puebla, Mexico being studied by a fellow graduate student at my university. It was a series of squiggles, beautiful as it was, it was utterly incomprehensible; it could have been an abstract work of modern art. After squinting at one section for a full minute, I was dumbstruck by the realization that I could not decipher a single letter. This, when the archival project I proposed for my dissertation research had already been approved by my committee and, for logistical reasons, it was too late to retool my project entirely from scratch. The ethnohistorian John Chance taught me that the only way to deal with the issue of paleography, or the scholarly interpretation of earlier forms of writing and the documents that utilize such writing, was to start trying to read them. No class or tutoring would be able to mitigate this particular process, he told me I had to start staring at the script and eventually it would begin to makes sense. This wisdom was confirmed by other researchers I met in Spain. One profesora from Mexico had taken several classes in Spanish paleography which, essentially, consisted of staring at texts until they began to make sense, albeit in a classroom environment where you could discuss particular issues with others and someone could check your transcription. However, the availability and cost of such classes can be highly problematic, and many researchers make do without such preparation. While 19th century writing is relatively modern and therefore accessible without preparation, those of other centuries will require practice. In any case, for someone who, like me, works with a wider time frame —16th to 19th centuries— self-study is the most practical route. The following two books were my introduction to Spanish paleography, and they remain my most valuable references. I highly recommend them to anyone preparing for archival research on Spanish colonial texts. Within the United States, at least, they are easily available from various university libraries through Inter-Library Loan. La Escritura y Lo Escrito: Paleografía y diplomática de España y América en los siglos XVI y XVII by Vicenta Cortés Alonso. Published in 1986 by the Instituto de Cooperacion Iberoamericana, Madrid (ISBN: 84-7232-393-5). This book is essentially an academic treatise on diplomatic writing and paleography of the 16th and 17th centuries, but its great value lies in its appendices, which contain, among many gems, a section on Normas de Transcripción that provides a basic introduction to some important norms for orthography, abbreviation, punctuation, etc., from this period. The final section, marked Abecedarios de los Documentos B Laminas de los Documentos B Transcripcion de los Documentos y su Comentario, contains exactly what it says, and is invaluable for practical exercises. There are 31 facsimiles of actual documents (laminas), accompanied by an alphabet primer relevant to that particular text (abecedario), and finally, a transcription of and commentary on the same text. 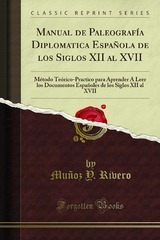 Manual de Paleografía Diplomática Española de los Siglos XII al XVII, second edition, by Jesús Muñoz y Rivero. Published in 1889 courtesy of the Viuda de Hernando, Madrid. 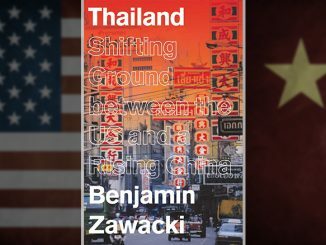 It is not as thorough as the previous text, however it deals with a wider time frame. While it includes some discussions of the Visigothic that are of no use to scholars of Asia, the remaining portions are of practical interest and, fortunately, presented in an easy to digest manner. Part I is an academic discussion of paleography, while Part II is the practical section essential to archival researchers. Pages 45 to 66 offers a detailed look at each individual letter of the alphabet, in both upper and lower case, comparing how it has been written over the centuries. This is followed by several chapters on abbreviations, numerals, and other orthographic minutia. Part III contains 34 brief transcription or reading exercises B sans answer key but pointing to specific pages in Part II that will help students decipher the text. I was fortunate in my particular research project to begin at the Vatican Film Library, where I read through a microfilm copy of the Pastells collection (more on this later). Pastells transcribed documents from various Spanish archives at the turn of the 20th century, first by hand and later with a typewriter. The ability to see the letters in the squiggles comes only with the passage of time, but the norms of abbreviation can easily be studied and memorized. By starting out with the Pastells collection, I was able to read real text from the 16th and 17th century and therefore learn its peculiar orthography, language, and flow but transcribed in the consistent and easy-to-read late 19th century hand of Pastells. After studying the Pastells transcriptions for a good month, I learned what to expect in terms of the abbreviations and other norms, and was therefore able to make the transition to primary sources without serious problems. From that point on, all that remained was to apply the paleography I had learned in order to decode what letters the squiggles represented. A final practical word about this particular skill is that it is like a muscle that requires regular exercise. Otherwise, the words again dissolve into squiggles. But the degeneration of this skill is mitigated by knowing the norms of transcription. Armed with this knowledge, it will take you only a few minutes, rather than hours, to get acclimated and unsquiggle the texts. A working knowledge of Spanish might seem an obvious part of one’s archival toolkit, but I’ve since learned that quite a few researchers make do with relatively minor reading ability. The historian Peter Schreurs, for example, began his graduate research on Limasawa and Caraga armed only with his knowledge of Latin, French, and Italian. With his lucky combination of great intellect and extensive historical knowledge, he worked past this limitation to learn both Spanish and Portuguese on the job. But most of us are not so blessed. For those who grew up in the Philippines speaking a Philippine language, Spanish will seem a familiar enough language, leading to the belief that one is able to read and understand it as I believed as well. 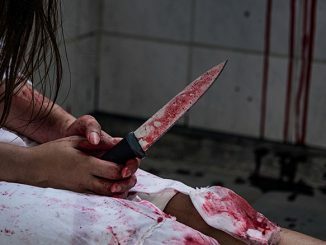 Certainly every Spanish word or phrase mentioned in this article will be comprehensible to most Filipinos, and at some level, we can get away with relying on instinct. But to work extensively with primary sources you will need at least an intermediate level of Spanish to do your work viz., if you are unable to read and understand every word of a short novel 2 or a long academic article (with a dictionary of course), then your level remains insufficient, for two reasons. 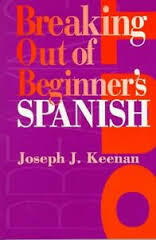 Breaking Out of Beginner’s Spanish by Joseph Keenan. 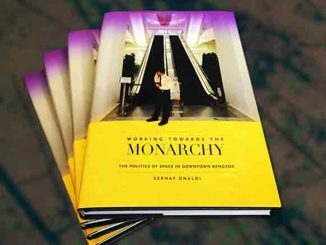 Published in 1994 by the University of Texas Press, Austin (ISBN:0-292-74321-1). …tambien les dixo el General q les vendiese algos bastimentos de arroz y puercos y gallinos q dixeron tener deloqal el mastre de campo vio en el Pueblo câtitad prometiero d traerlas y no lo puxieron ni bolvieron mas ni bolvió el q se ofrecio de yr a Tandaya y ellos quisieron cûplir cô solas palabras sin ninguna obra. …también les dijo el General que les vendiese algunos bastimentos de arroz y puercos y gallinas que dijeron tener de lo cual el maestre de campo vio en el Pueblo cantidad prometieron de traerlas y no lo pusieron ni volvieron más ni volvió el que se ofreció de ir a Tandaya y ellos quisieron cumplir con solas palabras sin ninguna obra. Note with dixo (dijo) and puxieron (pusieron) that you cannot simply replace every misplaced x with the same letter. Many misspellings are relatively easy to decipher, such as: rrio=rio; hedad=edad; caygamos=caigamos, qual=cual; hize=hice; muger=mujer. But often it is not just one word but a whole phrase that has to be deciphered, such as: andicho=han dicho; asido=ha sido; edado=he dado; evisto=he visto. In addition, if you studied Spanish in the United States or elsewhere in the Americas, you will almost surely be missing the familiar second person plural or vosotros form, which is used in Spain but not in the Americas. If so, then you must start paying attention to it. Beyond the academic part of the equation, you will need to know the language well enough to deal with the practicalities of your stay and of your research. In the archives you will need to comprehend and communicate in Spanish to place an order for a document or request a photocopy. Such tasks are not always straightforward, and I was surprised by how complicated it sometimes became. And even if, like me, you constantly forget your vocabulary, the staff will still appreciate your effort; it may mean the difference between your copies being available today or not until next week, when your visa has already expired. When you have ordered to view a document that does not materialize, it may mean the difference between the staff answering with a diligent I’ll see what the delay is about or a haughty It will get here when it gets here. I say this only because I had heard from others that the staff of the Archivo Histórico Nacional in Madrid were surly and unhelpful. 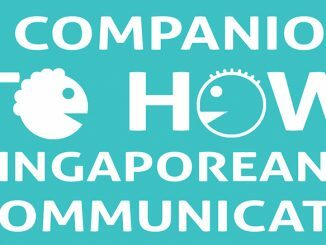 After my own very positive experience there, I would emphasize that any effort to communicate matters greatly, because even the most sophisticated, cosmopolitan Spaniard will grow tired of dealing with an English-only speaker. Beyond such basics, you need to take advantage of the expertise of others working in the archives (staff, fellow researchers) when you cannot decipher a word, or can’t figure out where to find something, which will happen very often. It will allow you to form friendships with colleagues there, the majority of whom will be from Spain and the Americas; it will allow you to attend academic lectures at local universities and institutes; and ultimately, it will expand your horizons regarding your own research. Considering the solitary nature of archival research, being able to follow a conversation in Spanish will, at the very least, make your life more bearable socially. I would like to direct an additional note on language to Filipinos in particular: Our indigenous language skills will make it relatively painless to pronounce modern Spanish (with the possible exception of the verb desarrollar). But there is also a distinct disadvantage to this because, with your ease in pronouncing the language, people will assume you know more than you actually do, and that you are either pretending to be dull or are in fact not very bright (maybe even mentally retarded). This will be on top of the inevitable issues of cultural difference you will already be dealing with. Ironically, I found that explaining my limitations got me nowhere. No one will believe you, especially if you manage to blurt out a well-practiced (and therefore flawless) Lo siento pero no puedo hablar muy bien. Eventually I decided to try changing my pronunciation to sound more unnatural, and the strategy yielded immediate results. People began using simpler, less colloquial words and were noticeably more patient in that I was not expected to know things only native speakers would know. Bear this in mind before you obsess about perfecting your pronunciation. If you wear prescription glasses for everyday use, consider getting a pair of reading glasses with anti-glare coating to minimize the potential for headaches from staring closely not only at paper documents but also at digitized documents on a computer screen several hours at a time. Another piece of equipment you might find handy is a large magnifying lens, preferably in a rectangular shape. Digitized documents can usually be zoomed to facilitate reading, but paper documents will not do that of course. If you are using a laptop computer, please take a few minutes to make sure that your keyboard can easily insert diacritic marks on top of and underneath letters, like this: à, í, ü, ñ, ç. You should be able to do this by pressing the equivalent mark followed immediately by the letter, e.g., for an umlaut (ü), you use the double quotation marks (“). It does not matter what word processing program you use because this is a function of the keyboard itself: you cannot program it differently. If your keyboard cannot do this in any program, you must find a different computer. Otherwise you will waste a lot of time going into the insert character utility of your word processing program over and over again. Diacritic marks are a key component of Spanish as a written language, and the wrong keyboard will be a big hassle. Also take note that computer keyboards in Spain are configured differently and will take some time to get used to. The final preparation to consider before we proceed to a discussion of the archives themselves is knowing what is available in each collection. It is our great fortune that in this day and age internet technology permits us to examine catalogs and sometimes even the documents themselves from another location. With the exception of the private Religious archives, i.e., the Jesuits’ microfilm library and the Recoletos’ Provincial archive, the archives discussed below can be searched online from anywhere in the world , all you need is a stable internet connection. The url for each catalog is provided below under the individual archives. The online catalogs were invaluable to me in terms of general preparation as well as writing my research and grant proposals. They also helped me immensely in planning determining how much time to spend at each archive. Moreover, the online catalogs will allow you to work more efficiently, because you will already have a list of documents to request when you arrive. 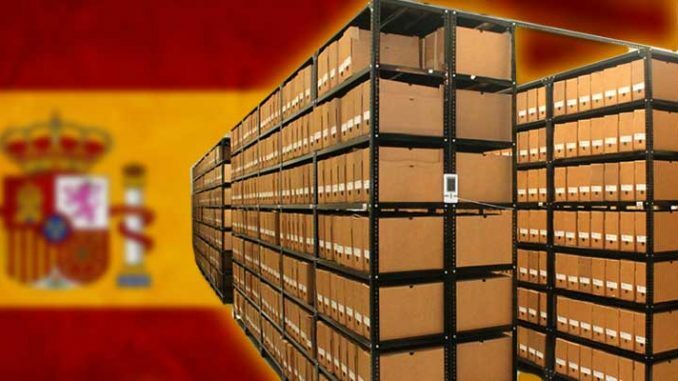 The gem of all online catalogs is that of Spain’s state-run archives, which is known as the AER or Archivos Españoles en Red, which is discussed the next section. The Archivos Estatales or state archives form a vital part of Spain’s national patrimony and cultural legacy. Researchers from all over the Americas and elsewhere go to Spain to study their histories. One day at the Archivo General de Indias (AGI), after reflecting on the rows of Andean and Amerindian faces in the sala de investigadores or researcher’s reading room, I had to ask one of the staff archivists how he felt as a Spaniard, seeing all these Americanos studying how his people had colonized theirs, studying their revolutions against people like him. He said he tried not to think about it too hard, but that Spain had no choice but to reckon with its own past, and that there was still much to learn. I mention this to remind Filipinos of the obvious: a considerable part of our own national identity is wrapped up in those archives as well. It is my hope that eventually more and more Filipinos and Philippinists make the journey to lay claim to that legacy, if only to come to terms with the totality of our historical legacy. Think of it as an academic hajj. When you do make that hajj, you will need a Tarjeta Nacional de Investigador or National Researcher Card, which is your research permit. It is referred to in print as the TNI, and verbally as the carnet de investigador (researcher I.D.). You apply for it in person at the first state archive you visit, and if you bring the right materials with you, 4 the application process itself will be easier than buying a train or airline ticket. When you apply for the TNI, there is a form to fill out, and they issue you a temporary permit, valid until your permanent research permit has been processed and approved, which normally takes a day. If they are not too busy, they should find someone to take you to the Sala de Investigadores (the reading room) and introduce you to the staff, who will show you how to log into, search through, order and/or view documents, and request copies from Athe system. The TNI is valid for three years and will give you access to all the state archives. All you have to do at each new archive is register at the office so that their computers will accept your login number (i.e., TNI number). You will need the TNI card to enter any sala or reading room. Memorize your TNI number, too, because you will need it to do anything in the archives, including log in, order a legajo (document bundle), request, pay for and pick up reproductions, and inquire about the legajos you ordered or reserved. If you lose your card, it will also be easier to replace if you know your number by heart. Outside the archives, the card can also be used as personal identification in a pinch. Applying for the TNI will be your first face-to-face contact with the state archives. While there is no need to dress formally, do dress presentably enough to demonstrate that you are a responsible person who will respect their archival treasures. With your TNI, you will be legally bound to follow all their rules, which were designed to preserve their collection for future generations. For example, under no circumstances are you allowed to wield anything containing ink inside the sala (try a mechanical pencil instead). Inside the sala of the AGI, there are armed guards who will not hesitate to remind you of this. A final practical matter for the state archives in general is that each archive has its own modus operandi and its own peculiarities. General information about the state archives (hours, services, directions, special advisories, 5 etc.) 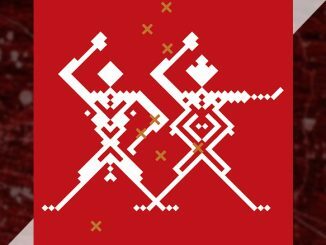 is available through the section on Archivos on the website of Spain’s Ministry of Culture, at http://www.mcu.es/archivos/index.jsp. Take careful note not only of their opening hours, but also the schedule for ordering documents, the maximum number of documents you can order at a time, and the normal schedule for photoduplication services. There may be busy days when you find yourself on the waiting list, but never despair because there is always some turnover of work stations during the day. For example, the AGI is most crowded in the weeks immediately before and after Sevilla’s world-famous observance of Semana Santa (Holy Week), but the longest I ever had to wait was one hour. For a relatively thorough orientation to the kinds of primary Philippine materials that can be found in Spanish repositories, I highly recommend the compilation below. Like a travel guide, it is by no means exhaustive, and provides only general information on the collections. It is nonetheless the only source I know that provides all this information in one place, and in my case it was invaluable for determining where to focus my research. 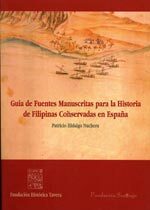 Guía de Fuentes Manuscritas para la Historia de Filipinas Conservadas en España by Patricio Hidalgo Nuchera. Published in 1998 by the Fundación Histórica Tavera in Madrid (ISBN: 84-89763-21-6). Patricio Hidalgo has other publications relevant to Philippine studies, though they are mostly bibliographic compilations, including a companion guide that lists repositories of primary sources located outside Spain. 6 I have not seen this particular guide, but it is no doubt as useful as the one cited above. This particular Guía de Fuentes is available in Spanish (and soon in English) through Digibis (Madrid) at http://www.digibis.com/catalogo.htm. The Digibis catalog also carries several CD-Roms B part of the Clásicos Tavera project B that compile many of the classic publications from the Spanish colonial period, and therefore an important resource for anyone with an interest in Philippine history. For those with concerns about ordering online from Spain, my experience with two separate credit-card orders was uneventful, and I received my orders (in the U.S.) within a few days. In both cases international shipping was already factored into the cost of each item. 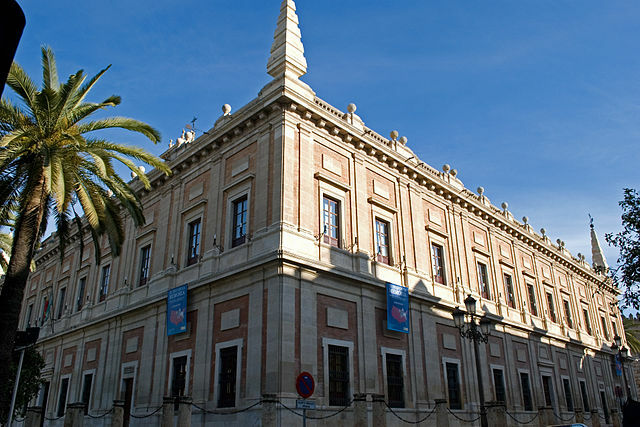 The Ministry of Culture in Spain is engaged in a long-term project to digitize and make available online their wealth of archival records. To this end, they have established the Archivos Españoles en Red (Spanish archive network) or AER, located at http://www.aer.es. Access is free of charge; you need only to sign up for an account (click on Alta de Usuario), upon which you will be issued a TNI number exclusively for online use. Please note that this number has no relevance offline you will still need to apply for a real TNI to use in the actual archives. Once you are logged on, you should explore this website as much as possible. Under Enlaces de Interés you will find some very informative links on archival research in general, and there is a bulletin board called the Foro de Investigadores through which you can ask all and sundry questions of other AER users. Under Búsquedas you can run systematic searches of the AER database, and the search results can be saved for future reference in your very own Agenda del Investigador. Try using the search engine or browsing through the catalog section by section. The escalator-like symbol next to a title indicates that there are subfolders, and the camera symbol indicates some digitized content in one or more subfolders. No special software is required to view the documents, and for ease of viewing you are allowed to manipulate the images to a certain extent (contrast, zoom, tone, etc.). All told, the AER is a tremendous resource, but no system is perfect. Bear in mind that, as with anything computer-related, there will be occasional glitches in the system, and at times the browser will unexpectedly freeze and shut down. The most relevant section will be the Documentos e Imágenes Digitalizadas, through which you will find a partial catalog of documents drawn from various archives, and digitized images of many of the these documents. If a document has been digitized, you will normally be unable to touch the original document due to preservation concerns. However, the quality of the AER’s digitized images is equal to what you will see at the actual archive. It will take time to get used to reading such documents on a computer screen (online or at the archives), but the resolution almost always exceeds anything that you may get as a printed image. Although they are all part of the same system of Archivos Estatales and therefore follow more or less the same cataloging system, specific style will differ slightly from archive to archive (including the AER, which is also accessible at the various archives). By browsing through the AER, you will learn how each archive is conceptually organized, and eventually you will learn which sections are most relevant to your work. Click on the Archivo General de Indias, for example, and you will learn that there are different Secciones containing very different sorts of documents, that those pertaining to the Philippines are not limited to a single Audiencia de Filipinas. Other archives directly relevant to Philippinists are the Archivo Histórico Nacional (AHN) and the Archivo General de Simancas (AGS). With regard to differing citation styles, i.e. to find the same document in the physical archive, take note of the catalog information that is provided in the full AER listing. As an example, let us consider a document from 1632 in which the Procurador General of the Recoletos, fray Pedro de San Nicolás, informs Bishop Arce of Cebu of Avarious crimes committed in the province of Caraga [eastern Mindanao] by some of its natives. This document refers to the Caraga Revolt of 1631, which is indexed as La sublevación de Caraga. Below is the information that appears on the AER catalog listing for this document. Notas del Archivero: Autor responsable: Guzmán Pla, María del Carmen. Whereas the AER reference number appears on top as the código de referencia, the rest of the listing informs you that the document is from the Archivo Histórico Nacional (AHN) and its call number or signatura in its home archive is ADiversos-Colecciones,26,N.62,” which is its location in the actual AHN in Madrid. The signatura antigua is its old reference number prior to the reorganization and computerization of the state archives, and is useful for checking references found in older bibliographies or studies. This part of the website is constantly under development, and each month brings new additions. At the time of writing, the Philippine images are relatively limited, and the AER contains only a small percentage of all documents that have already been digitized. Moreover, only a very small percentage of all Philippine and other documents have been digitized. But what is already available through the AER is of unquestionable value to researchers, as well as those preparing to undertake archival research. Before we move on the AGI, a few words about its geographical location. The city and province of Sevilla, in the Autonomous Community of Andalucía, is where the Casa de Contratación (House of Trade) was established in 1503 to regulate commerce, navigation, and many other matters related to the colonies. Nearly everyone and everything (including Magellan) went through here first. The main colonial archive, into which the records of the Casa de Contratación were eventually incorporated, was established here two centuries later. Sevilla is a beautiful, magical city that will inspire you to formulate more historical research projects just as an excuse to return. Of course, you will then have to do the actual research, but that’s life. Andalucía is also the home of the peculiar Andaluz speech pattern, which can only be described as Spanish at warp speed, so fast that whole consonants get thrown by the wayside. 7 For example, the question Cómo estás, Tomás? (How are you, Thomas?) will end up sounding like Cometá Tomá? Oddly, they also add consonants where there are none, e.g., the word edad (age) becomes hedad, with a hard h. If your name is Jesús you will be called Jesú. If you want two or three of something, be prepared for do and tre. And sometimes you will not know if you are being addressed in familiar or formal terms (quiere and quieres will sound exactly the same). At the AGI in Sevilla, many of the staff will speak this way. So will almost every food service worker in every eating establishment in the area. Just get used to it. If you are staying in Sevilla for several weeks or months, there are many affordable apartments or rooms available for rent, except during Semana Santa. Many of these are advertised online, and almost anywhere within the Centro of Sevilla is walking distance to the AGI. To gauge distances on a map, the distance between the AGI and the Plaza de Cuba (in barrio Triana, across the Guadalquivir River using the closest bridge, San Telmo) is roughly ten minutes at a leisurely pace. Almost any point within the barrios of Santa Cruz and Arenal is only five minutes away by foot, while those of San Vicente and Macarena may be ten. With all the walking you will do, I should also warn you against eating the oranges off those pretty trees that line the streets: the fruit is so bitter, even animals will not eat it. An option for researchers to consider is the Escuela de Estudios Hispanoamericanos (EEHA). It houses a respectable research library (though with only a handful of Philippine books), and has a Residencia for scholars coming from out-of-town. They also hold weekly lectures called mesas redondas on a wide range of research topics, and it is worth attending at least a few. They are often quite interesting, and you are also likely to see other AGI researchers there. Take advantage of these lectures to hone your listening and comprehension of proper academic Spanish is much easier to understand than everyday vernacular, especially in Sevilla. If you cannot find the schedule of lectures, you might just try showing up at the Escuela at a little before 7 pm on any given Tuesday and inquire at the reception. The EEHA Residencia is a good place for a brief stay, and there’s no denying that it helps your bona fides somewhat when colleagues find out you are staying at ALa Escuela. But as guests have no access to kitchen or laundry facilities, and the cost of outside laundry service is ridiculous (at least 7 euros for a single load of wash), unless you have a substantial grant you may wish to weigh other options. Some might also find the general ambience of the Escuela a bit off-putting. I heard more than one person joke that the place was so austere, it must have been designed by the Opus Dei. Finally, there is the 24-hour live and video security throughout the building and the grounds, which makes you feel safe until you realize that you are also under constant surveillance, except inside your room. Even if you have nothing to hide, it may eventually start to bother you. That said, the Escuela’s rooms are not only very secure, they are quite nice, each with a private bath, and ideally located at the Plaza del Duque (around the corner from El Corte Inglés, the largest supermarket and department store in town). At 40 euros a day, they are not cheap, but the EEHA offers residential scholarships (becas) for non-Spanish citizens. These amount to free lodging for a month or so, a value of about 1200 euros. More information is available at http://www.eeha.csic.es. Be prepared to use only Spanish in applying for this beca, and to demonstrate your competence in Spanish through the quality of your proposal and your correspondence with them. 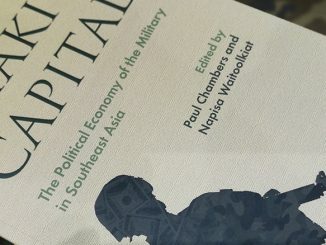 Philippinists should be aware that rarely do our kind make an appearance vis-à-vis the local academic establishment, and this rarity may cause them to take full advantage of your presence there. You might be asked (as I was) to give one of those mesa redonda lectures that are normally reserved for more established scholars. In fact, only becarios with a Ph.D. present their work, so I did not come prepared. Don’t let this happen to you. Knowing my own linguistic limitations, I was absolutely horrified by the prospect of speaking extemporaneously in Spanish, and tried to explain to the Director that, despite my reading abilities, I was in fact not ready to give a presentation in his language, and it would only embarrass them in the end. It would have been convincing except that I explained it just a little too well, so the Director chided me for joking around as he wrote down the date of my lecture. Most people will confuse good pronunciation with fluency, so let that be a lesson. As such, I had no choice but to spend all my free time for the next two weeks neglecting my other work in order to write a lecture in tortured Academy Spanish and pestering other, busier researchers to check my grammar. In English, I normally would not need more than an outline for such a presentation, but in Spanish I had to read it out word for word, to avoid embarrassing myself (and by extension all Filipinos). So, if you can, do prepare something in advance, even if it is only a basic Spanish translation of one of your old papers. Even if you never present it as a lecture, you can print a copy for anyone interested in your research. A good, basic orientation to the kinds of Philippine materials that can be found at the AGI is already available in pages 58-77 of Patricio Hidalgo’s Guía de Fuentes Manuscritas para la Historia de Filipinas Conservadas en España, mentioned in the previous section. There is no need to repeat it here. But I want to dispel the rumour I heard (which may still be circulating) that there is a room of Philippine materials at the AGI in which one can browse through random stacks of uncatalogued Philippine materials. I asked the archivist I became friends with there: there is no such room. Believe in conspiracy theories if you must, but the bottom line is that if it does not have a reference number in the computerized catalog, they cannot retrieve it for you. There are, however, many, many legajos that have only nondescript labels that say absolutely nothing about their contents. If you have the time to explore, it is worth the trouble to go through at least one or more of these, just to see what might be there. It might just be more workaday bureaucratic correspondence, filed in triplicate, informing the Governor General that his letter of a certain date had been received and that there would be a proper reply sent in due course, and in the meantime long live the King, may God keep Him for as many years he wishes as he defends our Most Holy Faith, et cetera, et cetera, et cetera. But even within that context there are many interesting possibilities, and you never know what you might find. When you are there, take the time to look through their library. Those bookshelves are lined not only with dictionaries but also with reference materials pertaining to Spain’s colonial history. Just browsing at random, I found a number of surprisingly useful books, including a comprehensive series that compiled the laws of the Indies, or rulings pertaining to the colonies, highlighting important legal distinctions between the colonization or pacification of the Philippines and the conquest of the Americas, especially with regard to the rights of indigenous leaders. There is a separate library from which books can be requested, reserved, and brought to your workstation. During renovations to the AGI, the card catalog and request forms are located right next to the entrance of the temporary quarters on Calle Sto. Tomas. This is something you can do should you find yourself on the waiting list or are having a particularly slow morning. The AGI has its own procedures for ordering legajos for viewing, and I will only include here the things that might be useful to know before you walk into the sala for the first time. First and foremost is that the staff will retrieve orders only three times a day B if you place your order before 9 a.m. (this includes orders placed after 1 p.m. the day before), you will get your legajos by around 9:30 a.m. After that, you must wait until after 11 a.m. to get your legajos. The final round of orders is concluded around 1:00 p.m. If you place your order after that time, don’t count on seeing your order until the next day, because the AGI closes at 3 p.m. By the same token, if you plan to arrive at the AGI first thing in the morning and expect immediate access to your legajos, you should order them by 1 p.m. the day before and place them in reserve. You can keep materials on hold if you plan to use them again within a few days, but you can have only three existing orders at a time. At this time, there is also a need to conserve table space in the sala (see fn. 5), because the current workspaces are not big enough for more than one legajo. The request forms on the archivists’ desks are for microfilm and other special items. Most of your document requests will made online from your work station. If you order something online and there is a microfilm copy, you will be asked to choose the microfilm copy, which will require filling out a paper form. If you want printouts of your microfilm pages, you must do it yourself at the machine. The staff will load the roll for you, and show you how to print; if you make only a handful of printouts, they will not bother with the charges. As for reproductions, photoduplication, and other services, you will need a master form (the largest form on the archivists’ desks) for each type of reproduction you are ordering. This means that you must list orders for printouts of digitized documents (imágenes impresas) and photocopies (fotocopias) on separate master forms. In each case, you can select one or more particular pages to be copied, or request a copy of the whole document B just make sure you indicate the page numbers clearly, and that the information on the master form matches the individual orders. In addition to the master form, each individual order for imágenes impresas is placed online from your work station. Each printout is relatively cheap and you will be tempted to order printouts of everything. The nice thing about imágenes impresas is that if you pay for your printouts by 11 a.m., you can generally pick them up after lunch on the same day. They say that, in theory, you can wait until you are done be it a week or even a month before you choose to pay. But please be aware that these orders are spooled on the AGI server and will remain there until you pay for your order. Too many spooled orders will shut down the system, and they don’t like it when that happens. Once your imágenes impresas order reaches a hundred pages or more, it’s time to pay up so that it can be cleared from the server’s memory. Payment is really the only bothersome part of the process because you must exit the archive and go to a bank around the corner, wait in line, wait for the teller to place the money in the AGI’s account, then take the receipt back to the AGI office to prove that you paid. At that point they will press the Aprint@ button and tell you how long it should take to print everything out. Photocopies and other reproductions of non-digitized items take much longer, and are ordered individually with a paper form that is inserted in the respective legajo. Make sure the information there matches what is on your master form. Photocopies at the AGI can take six weeks or more due to their backlog, but they deliver these orders by insured mail. If you order a lot of copies and printouts, you might find it useful to either retain a copy of your master form or write down the information in your notes for reference purposes. If your total order is massive (I have around 1500 pages of reproductions), doing this will allow you cross-reference the documents you have received and help you determine whether anything is missing. If like me you stay in Sevilla long enough and pick up some of your special orders in person, you might decide to mail them home in boxes rather than cart them around in your already heavy luggage to the next archive (remember, all those souvenirs will weigh a ton). The Sevilla post office has sturdy boxes for sale and insured mail is reliable and reasonably priced. According to my archivist friend at the AGI, if disaster strikes and the mailed reproductions are somehow lost, the AGI will try its best to help you out. If you retain a copy of your master forms, you will be able to re-order all the same documents by mail as a last resort. Of course you will have to pay for everything all over again, but you can do this by international wire transfer. The AHN is distinct from the AGI in that you will encounter a much smaller percentage of digitized documents here. Despite the relative inconvenience of having to order photocopies instead of imágenes impresas, this can be a welcome change after you’ve grown tired of staring at a computer screen all day. Their coverage of the Philippines is not quite as monumental and nebulous as that of the AGI, and therefore it will be in many ways much more manageable. Most of the materials you will find here are from later in Spanish colonial period, especially from the 19th century. Consequently, the correspondence and reports you will encounter here are somewhat more complete, and so much easier to read. Working at the AHN is much less complicated than working at the AGI. For one, it is a smaller archive, with fewer work stations in a very pleasant sala blessed with lots of natural light. Ironically, they appear to have the same number of staff working in the reading room. The AHN also has a treasurer only a few doors down from the sala, which means greater convenience in paying for copies. There is also a cafeteria only two buildings away in the same compound (ask the security guard). What I liked best about the AHN was that sala was quiet, even though it is located in the heart of busy Madrid. 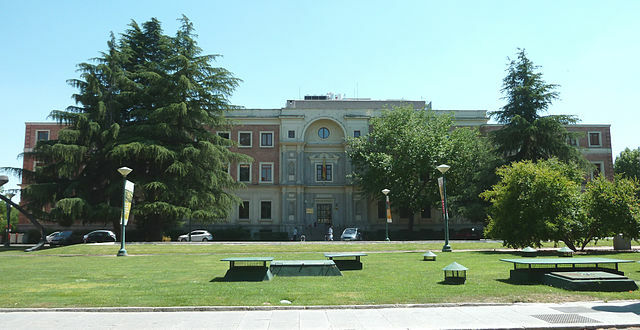 This is because, although the AHN is located inside the larger campus of the Consejo Superior de Investigaciones Científicas (CSIC) 10on Calle Serrano (a busy four-lane street), the archive is situated away from the main road, surrounded by other buildings that dampen the sound of city traffic. In contrast, the AGI is located in the heart of Sevilla’s tourist attractions, right next door to both the Cathedral and the Reales Alcázares. As such, researchers in the AGI listen to the klop-klop of horse-drawn carriages, the bustle of tourists, and the revving of automobiles all day long. As with the previous archive, there is a special residence for visiting scholars close to the AHN. Even those who are no longer students can stay at the Residencia de Estudiantes, and you can find the necessary information through their website at http://www.residencia.csic.es/. For those staying elsewhere in Madrid, the archive is a relatively long block from the nearest Metro stop (República Argentina on the no6 grey line), but it is a pleasant walk. The archives described below are open to the public, free of charge, but are considered Aprivate because they are not financed or run by government officials. As such, you will need to make your own arrangements with each individual archive, but as their mandates are similar to those of public libraries, researchers need not do anything in advance unless they are applying for in-house grants or are requesting special workplace accommodations. The exception is the archive of the Augustinian Recollects, for the simple reason that there is only one very busy archivist, and if he is away on business, no one will be able to help you, and you will have traveled all the way to the foot of the Pyrenees for nothing. The Vatican Film Library is located inside the Pius XII Memorial Library on the lovely campus of St. Louis University (SLU), a private Jesuit school located in the midwestern United States (not to be confused with the actual Vatican Library in Rome). The Film Library contains no original manuscripts but microfilm copies of materials from other Jesuit repositories, including their Roman archive. Through their website, http://www.slu.edu/libraries/vfl, you can learn more about their collections and the fellowship options for researchers from out-of-town. They do not have an online catalog. 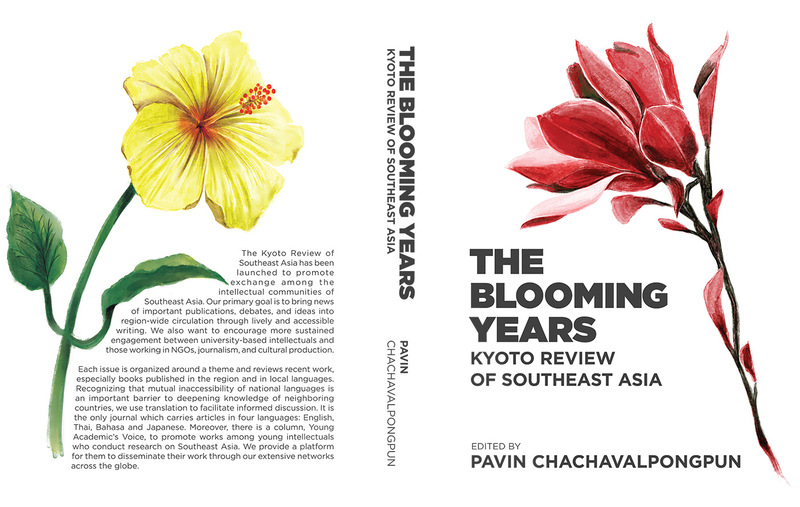 Philippinists will be interested two collections, both of which are extensive. The first is the Archivum Romanum Societatis Iesu or ARSI collection, which contains administrative records from the Jesuit Generalate in Rome. There is material from every administrative region or Assistancy, including the Spanish Assistancy, under which records of the Philippine Province can be found. In their bound catalog, look under Assistentia Hispaniae > Provincia Philippinarum. There are 12 ARSI microfilm rolls pertaining to the Philippines, including some with interesting but brief biographies B in Spanish B of Jesuit missionaries who served in the Philippines. But most of the rest of the ARSI is in either Latin or Italian, the languages of the Vatican, and my very limited knowledge of these languages prevented me from learning much from this collection. The second, of greater interest, is the Pastells collection, which is essentially a microfilm copy of the original Pastells collection housed in the grand Catalonian archive of the Jesuit order, the Archivum Historicum Societatis Iesu Cataloniae (AHSIC) in Sant Cugat del Vallés, Barcelona. Hidalgo’s description of the AHSIC’s Pastells documents (pages 267-273 of the Guía de Fuentes) of course applies to its duplicate in the Vatican Film Library. In brief, the Pastells collection is comprised of transcriptions made by Pablo Pastells, S.J., at the turn of the 20th century, of primary sources found mostly in the AGI in Sevilla, but with a few from the AHN, the Archivo General de Simancas (Valladolid), the Biblioteca Nacional (Madrid), the Real Academia de la Historia (Madrid), and various Jesuit archives. In the course of undertaking this project, which was primarily about the history of the Jesuit order, Pastells transcribed documents pertaining to the political and ecclesiastical history of the Philippines. Pastells himself had worked as a missionary in the Philippines in the late 19th century, serving eastern Mindanao for over a decade. The larger collection has considerable coverage of the American colonies, as well as the Marianas, China, and everywhere else the Jesuits traveled in Asia. The Vatican Film Library is a sadly under-utilized resource in terms of Philippine historical studies, and I was told in 2004 that I was the first person to check out the Pastells microfilm collection in a very long time. That said, you can be sure that fellowship applications for research about the Philippines will be eagerly considered by the library. There are some practical issues with regard to using the microfilm collection at the VFL. The first is that their machines are so old, they look like Soviet-era contraptions and will feel awkward if you are used to modern microfilm readers. That said, they are purely mechanical, using only a hand crank, and therefore do not require any special training and are less likely to break down. However, the text is not quite as clear in these older machines, possibly because of an inferior light source. The second issue is that these old machines are not connected to any printers. However, on the second floor of the Pius XII Memorial Library, you will find about six modern microfilm readers, four of which are connected to rudimentary printers, and two of which are connected to scanners. You will of course need explicit permission to take the microfilm out of the VFL reading room. You can use either coins or copy cards (available on the main floor) to pay the per-page printing fee. If you want to retain reference copies of more than a few pages, however, you have the option of using the Minolta scanners to read the microfilm and convert the images into a PDF document, which you can then save and take home on a portable storage device, such as a floppy disk, ZIP disk, or USB drive. In my case, I would load the scanned documents onto a removable USB drive until it was full, then download its contents into my laptop’s hardrive, and then use my CD burner to create a backup. Then I would empty my USB drive and return to the Minoltas to scan some more documents. Of course, you will need to ask one of the librarians to show you how to use these machines, which are splendid but tricky. When I was there, they did not have any CD burners on the library’s computers. But technology always changes, and as I write this, it has been over a year since I used their machines; I recommend calling first to verify what recording options are actually available. St. Louis, Missouri, is easily accessible by air and car, and a range of local accommodations is available, including SLU’s in-house hotel, the Water Tower Inn. You can find some very basic information through their website at http://www.slu.edu/events/wti.html, but you’ll need to call for their rates. Even though the Water Tower Inn is relatively economical, and there is a considerable discount for long-term stays, I also suggest calling the VFL secretary in advance to ask about other options. I started out at the Water Tower Inn, but courtesy of the VFL secretary, I was pleased to move to a closer and much cheaper apartment being sublet for visitors by the Center for Medieval and Renaissance Studies. The university’s cafeteria and a student center with various food service options are both within a two minute walk from the library. The VFL itself is currently located in an odd corner on the ground floor of the Pius XII library, and the environmental controls in that room only seem to work at full blast. In the summer, it will be freezing, no matter where you sit: bring a sweater, warm socks, and maybe even a scarf. The Newberry Library is another profoundly under-appreciated and under-utilized resource for Philippine history and ethnology. 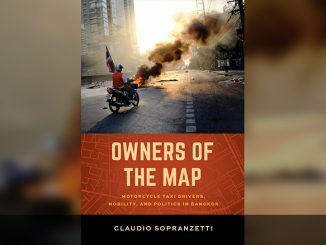 It is a treasure trove of books, manuscripts, maps, and pictures, all of which are potentially relevant to a wide range of research possibilities. It has a very special connection to the Philippines in the form of the Ayer Collection, which was originally assembled at the very beginning of the American occupation of the Philippines. Many of the Ayer materials are unique, salvaged from the Barcelona library of the Compañía General de Tabacos. There are excellent materials dating from the latter half of the 18th century until the Revolution. There are hundreds of photographs from the Dean Worcester and other collections. There is an assortment of manuscripts and booklets on the religious missions, the British invasion of Manila, various explorations of the archipelago, and their accompanying maps, from the Spanish period. They also have accounts of early explorations of the New World and the Philippines, including a reportedly contemporary copy, in manuscript form, of an eyewitness account of Legazpi’s arrival in the Philippines in 1565. A very large portion of Blair & Robertson’s 55-volume compendium The Philippine Islands 1493-1898 12is in fact comprised of translations from materials in the Ayer collection, which underscores the breadth and significance of this collection. Rizalians will be delighted to know that there is a precious handful of correspondence by our dear José Rizal. This includes a sparsely filled notebook in which he wrote down how much he spent on food and other expenses in Madrid, and in which he laments on March 31st (the same day he spent 1,20 pesetas in stamps to mail a letter to the Philippines) that, my days pass with speed and I find that I am very old for my age; I lack the joy of young hearts… 13 Filipinos overcome by homesickness while at the Newberry can take comfort in the bust of Rizal that watches over the Special Collections reading room. The reading room itself is a very pleasant and quiet place, and in late 2004 they were talking about providing internet access from there, which would make it easier to cross-reference the library’s catalog as you work. The staff there is incredibly efficient, helpful, and accommodating, but every archive has its conventions and procedures. To stay in their good graces, do memorize the in-house rules (no pens, etc.) and observe them diligently. The Newberry has a very accessible and informative website, which includes an excellent overview of their collections. Go to http://www.newberry.org/ and browse under the ACollections & Catalogue@ section. Please be aware that less than half of their collection is represented on the online catalog, but it is constantly being updated. Most of the original Philippine manuscripts can be searched only through the old-fashioned card catalog. But those with access to a university inter-library loan system within the U.S. will easily find a copy of the following reference bibliography, which is the single best introduction to the Newberry’s Philippine treasures. Calendar of Philippine documents in the Ayer Collection of the Newberry Library, edited by Paul Lietz. Published in 1956 by the Newberry Library, Chicago (ISBN: 0911028013). It is out of print, but I was able to obtain a used copy from the online bookseller Alibris for less than $10. The Newberry of course has in-house copies for researchers to consult. On the same website, in the Scholars & Teachers’ section, researchers will also find a wide variety of in-house fellowship and financial aid options for working at the library. Some housing options for researchers are available on the FAQ page for Fellowships, with additional options available by writing the Research & Education office. Even without a fellowship, I highly recommend contacting the Research & Education office to negotiate some form of affiliation. Fellows and other scholars so recognized by the Newberry have important privileges in that you are allowed to reserve microfilm and certain categories of books, and are given your own study carrel, through which you also receive high-speed internet access. You will also be allowed in the library after public hours, during which you have no access to the special collections but are free to browse the card catalog, use the microfilm reader, and pore through the reserved materials in your carrel. You will also be able to use the employee lunchroom and leave things in the fellows’ room, which might make your daily commute easier. In addition, an affiliation might in some cases give you access to Chicago’s other private libraries, including those at the University of Chicago. Finally, a fellowship or other such affiliation with the library will place you in the company of scholars whose companionship and insight may prove valuable to your own quest. This particular benefit of my affiliation with the Newberry remains my fondest memory of my time there. 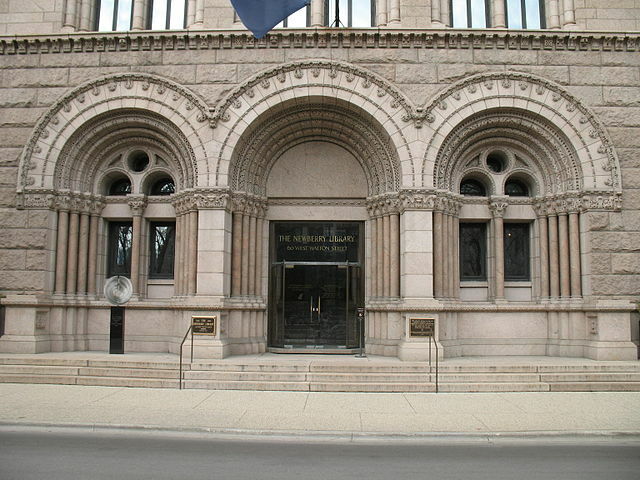 The Newberry Library is located in possibly the most beautiful neighborhood in Chicago, known locally as the Gold Coast. It is in the heart of The Loop@downtown and directly across the street from Washington Square, a quiet and unassuming park with a colorful history. 14 The library is easily accessible from anywhere in the city through public transportation, lying equidistant to both the Clark & Division and Chicago stations on the El train’s red line. A great many bus lines also pass through this area. At certain times of the year, downtown Chicago is itself so pleasant to walk in that you might find yourself going past your regular El stop just to have a longer walk. All things considered, it is one of the most pleasant places I can think of to do archival and library research. Of all the archives described in this article, the Provincial archive of the Augustinian Recollect Order in Marcilla (ARM) may be the only true logistical challenge for the researcher. This is because it is located in a very small rural town (pop. 3,000 or less) in economically depressed northern Spain, and you will be at a loss for finding accommodations. Also, no one in this town even among the Recoletos themselves speaks English, or will admit to doing so. This part of Spain went to Franco during the Civil War, and there remains a streak of conservatism that may prove a challenge for some, especially after such cosmopolitan centers as Sevilla, Madrid, and Chicago. People are no more religious here than in the rest of Spain, but they will nonetheless make it their business to know whether you are Catholic, and whether you in fact attend Mass regularly. That said, nowhere else in Spain was I welcomed so wholeheartedly into local people’s homes, and made to feel like a treasured part of their lives. I made some real friends in Marcilla, and I miss them very much. The Recoletos have very significant historical tie to the Philippines, for that is where their Order spent their formative years as a missionary order, starting in the early 1600s. The Philippines, especially the Visayas and Mindanao, was their first mission field, and some of the Recoletos’ most important figures earned their stripes, and sometimes their martyrdom, there. As the Fathers and Brothers in Marcilla will tell you, the Philippines, and Filipinos, still hold an important place in their hearts. Marcilla itself has a special connection to the Philippines in that until the mid-1980s this was where new Filipino priests and brothers came to receive their theological formation (education) within the Order. In 1998, the Philippines was given its own Provincialate, and the Province of San Ezekiel de Moreno was born. Since then, the original Province of San Nicolás de Tolentino has focused on its remaining mission fields, primarily in the Americas. However, the Recoleto convent in Marcilla retains possession of the archives pertaining to its genesis as a Religious Order. This means that all their original records on the Philippines from the Spanish colonial period remain in Spain. However, Filipino Recoletos undertook a project some years ago in which a large portion of the original Provincial archive referring to the Philippines was scanned electronically and preserved on CD-Rom. Researchers in Metro Manila might want to first inquire about accessing those digital records before planning a journey to Marcilla. I compared the CD-Roms’ contents with the actual archive and can tell you that the scanned documents are of good quality, and the CD-Rom collection is quite comprehensive, with the documents arranged in the correct order, retaining the pagination of the original legajos, etc. But they do not include everything, and in the case of one very long document from Legajo 61, some pages were omitted. In any case, even though holding the actual documents in your hand is, in my view, a singular experience, the CD-Rom version is a worthy substitute, especially for those who cannot afford to travel to Spain at this time. As to the contents of the ARM, they will concern mainly those researchers whose areas of interest were part of the Recoleto mission field, including but not limited to northern and eastern Mindanao (Misamis, Caraga, Surigao, Agusan), where they planted and maintained new missions from the 1620s until the late 1800s, when the Jesuits moved in. Local history buffs will be particularly delighted by the detailed coverage of Misamis from the 18th century on. Those Mindanao historians who have relied on the Jesuits for information will probably be stunned when they learn how important the Recoletos actually were to the island’s history, and that proper credit for the successful Christianization and Hispanization of north-eastern Mindanao indeed belongs to the Recoletos. 15 It’s true that the Jesuits tried to plant the first ever mission in northern Mindanao in Butuan in 1596 but it was never fully established, and faltered due to personnel problems. They soon abandoned this part of Mindanao to the newly established Recoleto Order, also known as the Agustinos descalzos (barefoot Augustinians). Other significant fields were parts of the Visayas especially Mindoro, and various parts of Luzon. Those researching the Muslim/ Moro areas of the Philippines will also find some interesting material on piracy and other interaction between them and the missionaries. In addition to the ARM itself, the Convento has a very good library on religion and missiology that is worth a serious look. On the practicalities of using the ARM, the archive itself is in clausura (cloistered), but they have a general index that will help you decide what legajos to ask for. Since they rarely have researchers passing through, procedures, schedules, and other terms will have to be negotiated with the Father archivist on an individual basis and entirely in Spanish. The current archivist, Father José Manuel Bengoa, is himself a scholar and despite his young age has already published extensively on the history of the Recoletos. 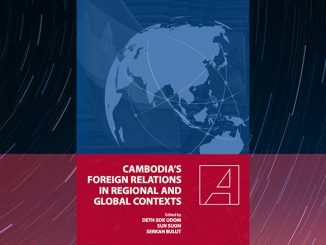 He is an outgoing, jovial person whose enthusiasm for his work and his vocation is a welcome change from the weighty scholars you will no doubt have met in the course of your research. He can speak Italian, but not English. The Convento itself is a very peaceful if lonely place to work, with all the modern conveniences, including efficient radiators and high-speed internet. 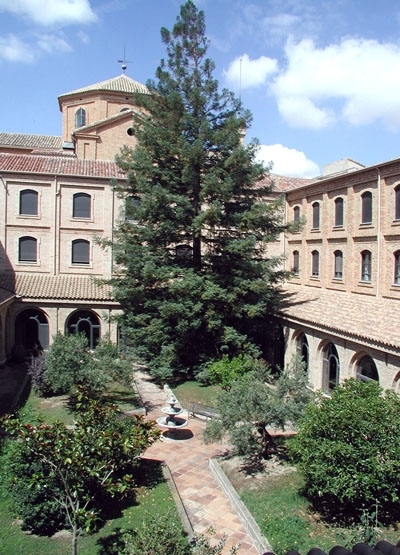 The Marcilla convent of the Recoletos has a website at http://www.terra.es/personal2/recole01/, but you will not be able to find information about their archives there. Best to write the general email address, and then wait for the archivist to write you back. Be patient, because he is often traveling. For the ARM archive on CD-Rom, the homepage for the Philippine Recoletos is http://www.recoletos.ph/page/home, and the contact information for their Provincial center in Quezon City is at http://ezekiel.pinoyrekoleto.com/contact_us.html. In terms of the logistics of going to Marcilla, the most direct route is to fly into Pamplona, take a taxi to the bus station downtown, then take the regular bus service, which is run by Conda S.A.. They have a good website with an English version at http://www.conda.es/index.php?idi.eng. The last bus that passes by Marcilla leaves at 8 pm daily, and will drop you off rather unceremoniously an hour later at an unlit stop about 50 meters from the entrance to the Convento. The fare is extremely cheap, almost negligible considering the distance they take you. You will of course not be staying at the Convento, unless you happen to have a relative in the Order, or are yourself a Religious from another Order. There is only one commercial accommodation in Marcilla, a hostel (locally referred to as la fonda, or Athe inn) just a short walk away but then again, everywhere in town is a short walk away. Fearing that the Recoletos would cloister me in the nunnery on the other side of town, I insisted on staying at the fonda. It certainly made for a very colorful experience, but if I could turn back time and do it all over again, I would beg Fr. José Manuel to place me with one of his parishioners. If you stay several weeks, as I did, then the fonda’s cheap daily rate (minimally edible food included) is just not worth it, unless you delight in sharing a single bathroom with anywhere from 2 to 6 (possibly more) other people who, like too many people in Spain, are incorrigible smokers. While I never felt my personal safety threatened there, I did not enjoy being the only female boarder at the fonda, and was relieved when the waitress the most colorful character of them all moved in temporarily to save money. Incidentally, the fonda will also do laundry for you, at a per-load price, in a doubtful washing machine. In sum, the fonda is on the dodgy side and not a place for the weak-hearted. The town of Marcilla itself has a government website at http://www.marcilla.es/, and an amateur website at http://www.telefonica.net/web2/marcillaot/. One thing to bear in mind is that Marcilla is at a relatively high elevation (almost 1,000 feet), and on the edge of the lovely Pyrenees mountain range. In April it can still get very cold here, sometimes even freezing, at night. But for this inconvenience you are rewarded with perhaps the most beautiful and sparsely populated natural landscape in Spain, and encounter some of its most considerate and good humoured people. If you can find a way to take a drive through the countryside, through the well-preserved medieval towns, and into the neighboring Basque region, do not hesitate to do so. I hope that this information encourages others to explore some of these archival treasures, and that they come to be exploited as fully as possible by Philippinists. More potential repositories of records from the Spanish colonial period remain, including the archives of Mexico. In the meantime, please feel free to contact me directly if you have specific questions regarding the archives and places mentioned in this article. My contact information will be updated regularly on the Philippine Studies Group website, which currently is located at http://psg.csusb.edu/. not been updated or checked since that time.